I've professed my love of the art of Shag (aka Josh Agle) many times in this blog. And Dark Horse comics makes some very cool stationery out of his artwork. 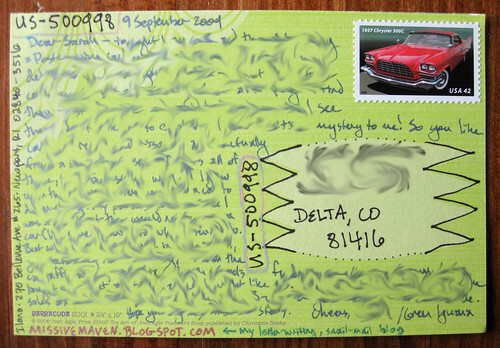 I recently learned that Chronicle Books makes a Shag Postcard book, too! Shown above is "Barracuda," which I sent to a Postcrosser with a username Saracuda. I thought that was a fun synchronicity. The back is fun, too. It's a bit coated and isn't perfect for all fountain pen ink, alas, but the great design almost makes up for it. The spot for addressing has a kind of blaze shape (which I accented with Sharpie here) and there's a curtain-esque design hanging down from the top left corner. 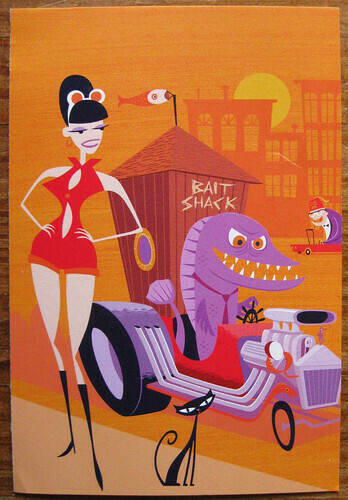 I may have to post some more Shag postcard images in the future, his designs are so retro fabu. these are ultra fab and cool . I love them . I like the wonder woman dark horse comic stationery . thanks for sharing and posting this . I see what you mean with the similarity in styles between Red Tango and Shag - but no, they are two different artists. I like both their cats, though!